A cold evening returning to London on Paddington platform. 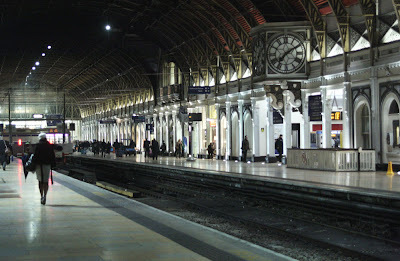 Nice picture of one of the London stations I know the best - Heathrow Express! A great thing about railway stations is the mix of sounds there. Fun to record and play back at a later date. Great photo! It makes the impression! You always take the most beautiful photos! What an excellent shot! Stunning! Beautiful light , never saw a clock so big before ! Great shot! I love that clock. Love these train / terminal shots! Awesome picture. I love LONDON! Great site of great photos - no wonder you are a 'blog of note'!! I found it very interesting. Keep up the good work. I am brasilian, from Rio de Janeiro. I miss london. Beautiful city. Some day I'll be back there. Beautiful, you've captured the light and architecture brilliantly!